Preheat the oven to 350 F. Combine the panko, lemon juice, 2 ounces of olive oil, and parsley in a bowl and toss until evenly distributed. Spread the breadcrumbs on a baking sheet and toast in the oven until light brown. Cut the bacon into matchstick-size pieces and cook until crispy. Reserve the bacon for another use and save all the rendered fat. Keeping the fat warm (so it stays fluid), mix the bacon fat with the vinegar in a ratio of 4 parts fat to 1 part vinegar (for example, 1 cup bacon fat to 1/4 cup vinegar). Stir in the shallots and keep warm. Preheat the oven to 500 F. Cut the okra in half longways and toss it in olive oil, salt, and pepper. 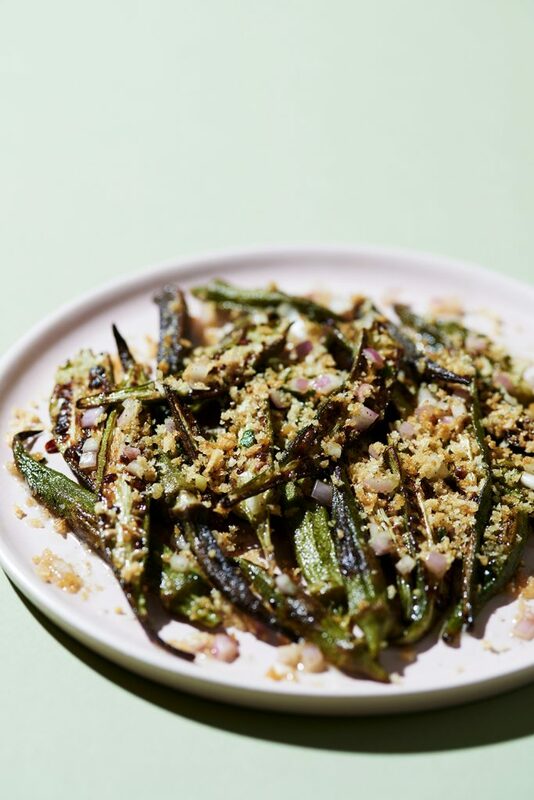 Place the okra in a large cast iron skillet and bake in the oven for 8 to 10 minutes, or until many of the okra pieces are caramelized and crispy. Transfer the okra to a plate and drizzle liberally with the warm bacon vinaigrette. Top generously with the breadcrumbs. Finish with a bit of flaky sea salt.